Petrohawk has sold yet another asset to fund its Haynesville and Eagle Ford drilling budgets. 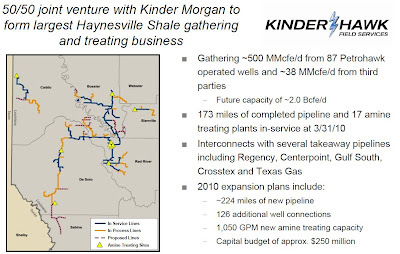 This time, the company sold half of its gathering and treating business to Kinder Morgan Energy Partners, LP for $850 million. With this sale, the 2010 divestiture tally stands at $1.4 billion. 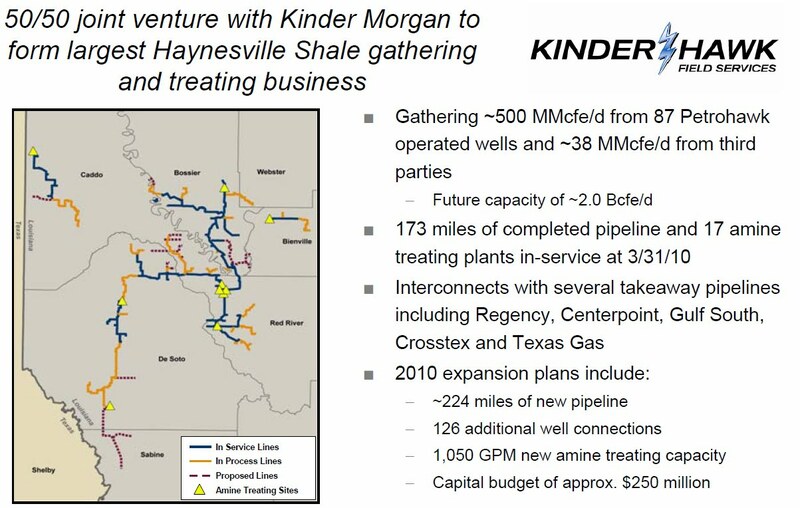 The gathering system has about 173 miles of pipeline currently in service with another 224 on the drawing board for 2010. There are 17 amine treatment plants in service with 1,050 GPM new amine treating capacity in the works for 2010. This is the last of the company’s major divestments for the year. Let’s hope that natural gas prices will provide Petrohawk (and other producers) with enough cash flow to prevent another yard sale of “non-core” assets. So What Do You Think About Arthur Berman? Exco Comments on "Well Control Event"
Hey, Did Someone Say, "Curtail Production?"